So close to Rome, only 25 -30 min. 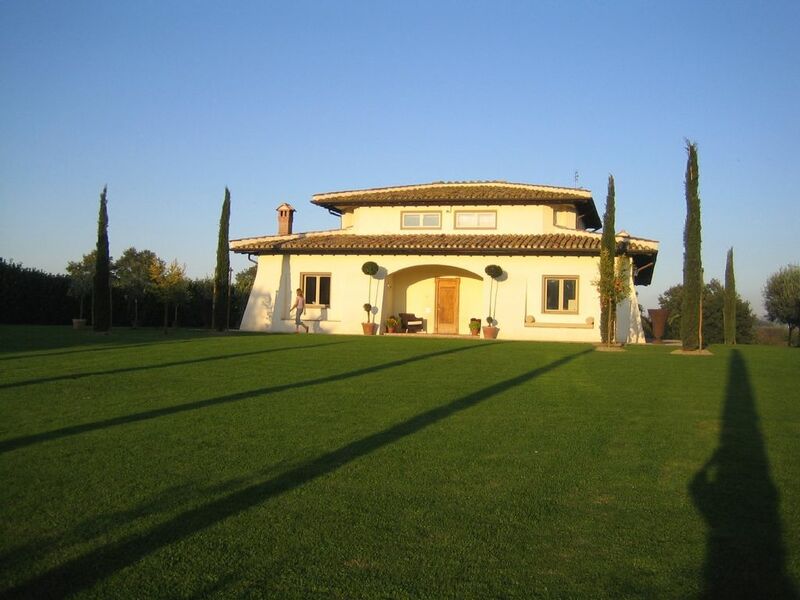 driving from the centre, this sunny peaceful and elegant villa is so perfect to enjoy your summer vacation. Relax by the pool, have a Mediterranean style lunch on patio, watch sunset with chilled glass of wine. Villa romantically set inside of Etruscan natural park Veio- most beautiful countryside of region Lazio with famous lakes Bracciano and Martignano just near by. Our villa is very spacious- filled with antiques, has a living room of 150m with fire place in white Carrara marble,with antic velvet curtain of 17th century,with marble staircase leading to master bedroom with big bath and peach marble mosaic shower. There are 2 other guest bedrooms on the level of the living room- each with own bathroom, and on Park level is an amazing suite of 100m. with fireplace -it is like a loft (in reality two rooms put together) - all open space with 1 king size bed and Empire divan and other antic day bad facing the garden with palm trees and long swimming pool. Air condition. Welcome! Working in fashion industry for 20 years - love my work and my life. My family values are important to me - it is also to be tolerant, agreeable and listen one another. Beauty dependant I love great conversation and interesting people. Traveling and learning other cultures is been my best teacher! The love from the first sight... you know this feeling...? Original and rare in its character- only for those who settle for the best. Peaceful and charming , glamorous and romantic ! In all 3 bedrooms and living room Only 1 bedroom has no air conditioning. We were all from New York - 3 stressed couples from the Wall Steet... Needed a break immediately and Italy was calling. We found Villa Roman as a perfect travelling destination - only 20 min outside of Rome and living rich and famous meanwhile. The house is gorgeous, comfortable and tastefully decorated (you would want to hire the owner for your next interior design project!). It also has an amazing outdoor pool that you want to jump in at any kind of weather. We also found plenty of things to do: sightseeng at Rome, long walks, and just relax by the pool. The food was divine. The owner provided an exceptional service. We are planning to come again and again. My wife and myself stayed here for a week in May of 2008. The location was perfect, near enough to Rome but located in the most beautiful area with trees, grass and wonderful views. Nearby was the most charming town with hardly any tourists. Staying at this magnificent house was just great. It had everything anyone could want in terms of luxury accomodations, modern bathrooms, great beds. You could not ask for anything more. As for the service, it was also first class, with our every needs attended to in a very personal manner. We would recommend it anyone who wants the very best and intend to return whenever we can. Other Activities: shopping for antics, hot springs, archeological sites,ruins - 30 min. drive. Famous 2 outlets - Prada, Gucci, Valentino, La Perla within1 to 2 hours drive. Golf: The golf course 'Olgiata' which is 10 min.drive along via Cassia - is 27 holes in lush countryside. Min.2 weeks rent in July And August.50% deposit is taken at time of booking entire villa. Payment in full required (cleared funds) at least 8 weeks prior arrival date . Security deposit of 1000 Euro is to be paid on your arrival and to be returned within 14 days of departure - subject to confirmation that no damage has occurred. Payment by bank transfer only. Additional charges may apply - final cleaning, take out garbage, AC usage.